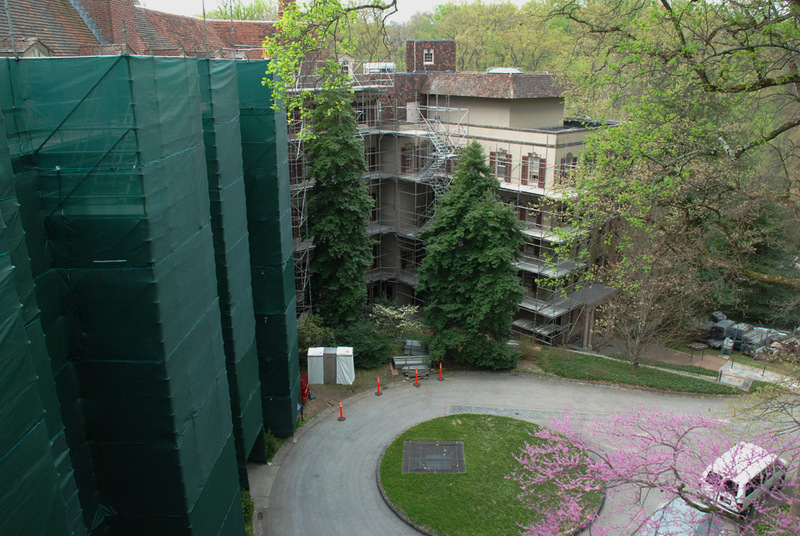 Today’s challenge was to erect a scaffold, stair tower, trash chute and debris netting on the clock tower at the Holy Ghost Preparatory School, built in 1897, without disturbing the masonry or upsetting the landscaping. 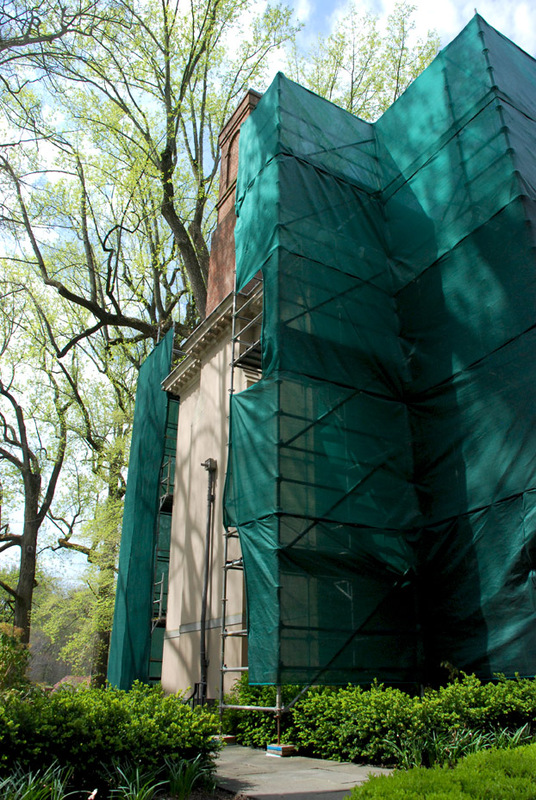 Luckily Pinnacle Scaffold specializes in working with historic structures. (see our webpage for examples) We were honored to work with the good people at Holy Ghost Prep to help them repair the parapet and spires on the clock tower of the main building. The school is a private Catholic college preparatory school for young men in Cornwells Heights, Bensalem, Pennsylvania within the Archdiocese of Philadelphia. It was founded in 1897 by the Spiritan missionaries. 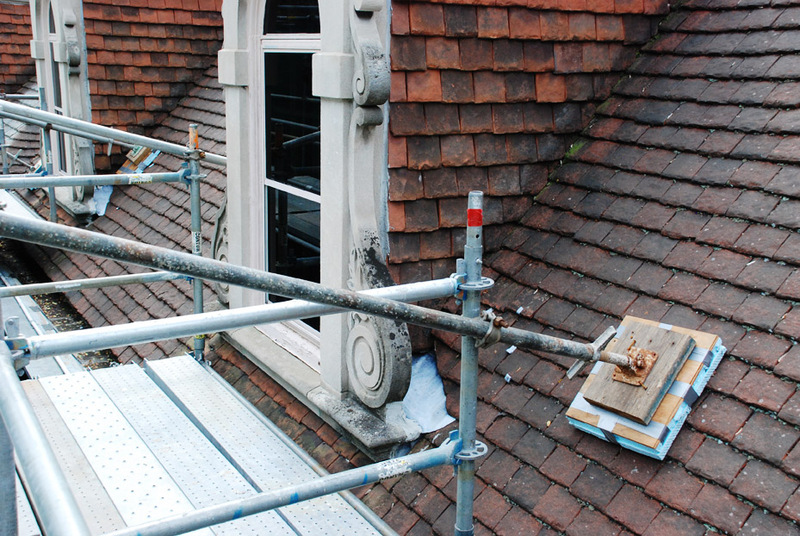 Crews needed access to the roof to remove and repair spires and replace the damaged parapet wall. 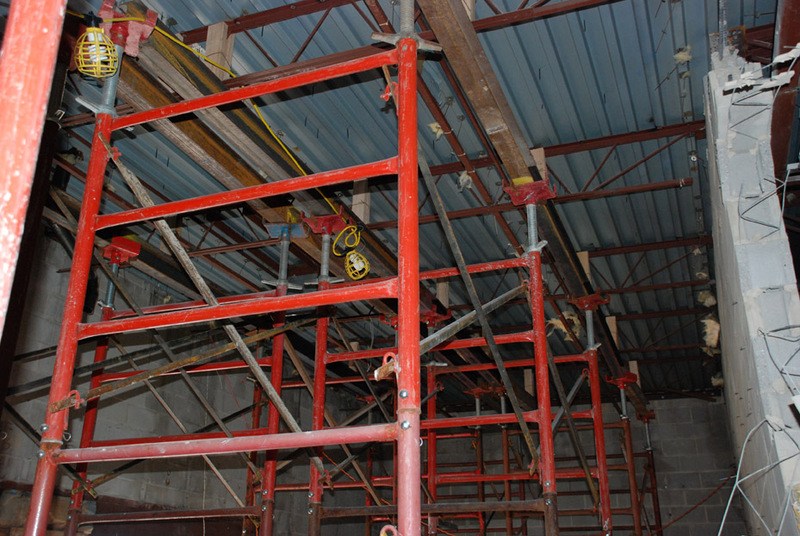 We used system scaffold and decked in the top two levels to give them a solid work platform. Here you can see what the tower, spires, and parapet normally look like. 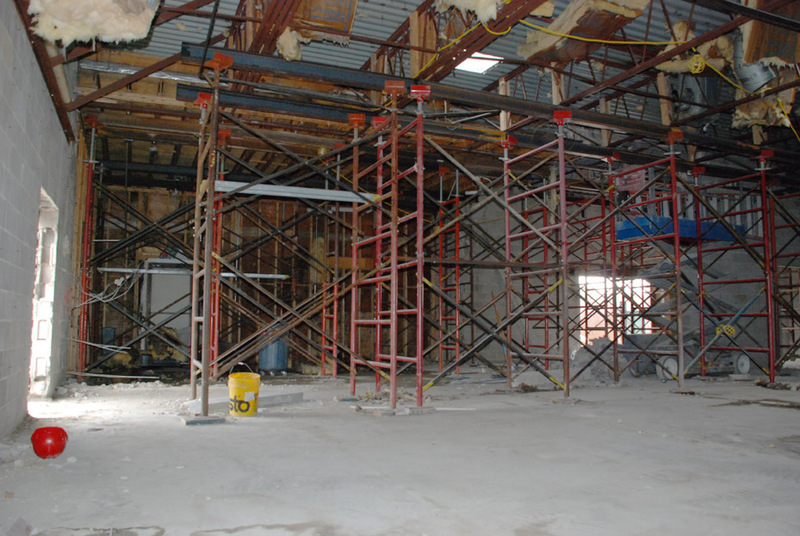 We built an intricate stair tower for crews to gain access and then fenced it in for added protection. They also needed a trash chute from the top of the roof down to the dumpster on the ground level. Here you can see the access needed to get to the crumbling parapet walls. It also shows where the spires used to be. They will all be put back up again once everything is repaired. 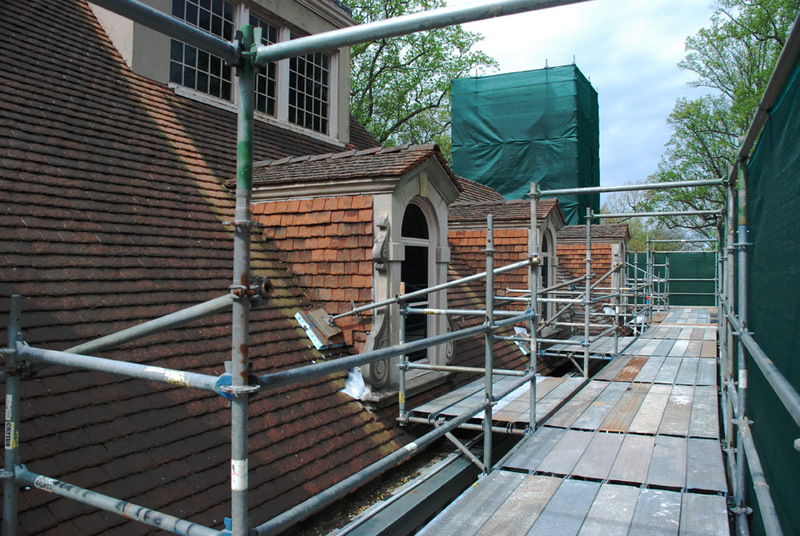 Crews are replacing and repairing the stones and masonry work around the parapet. Time and the elements will take a toll on the masonry work. Every decade or two they need some touch up. This is the base of one of the spires that is being repaired. Here you can the access we provided all the around the parapet. 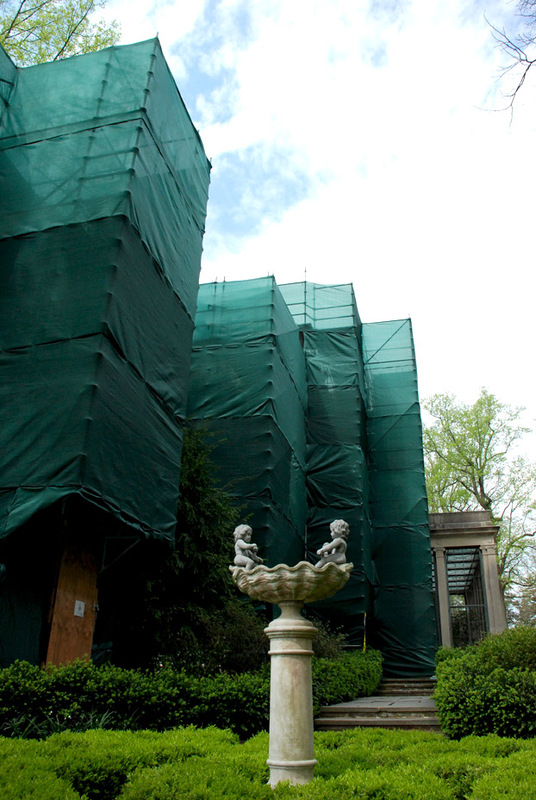 And in the second shot you can see the debris netting we installed for added protection. 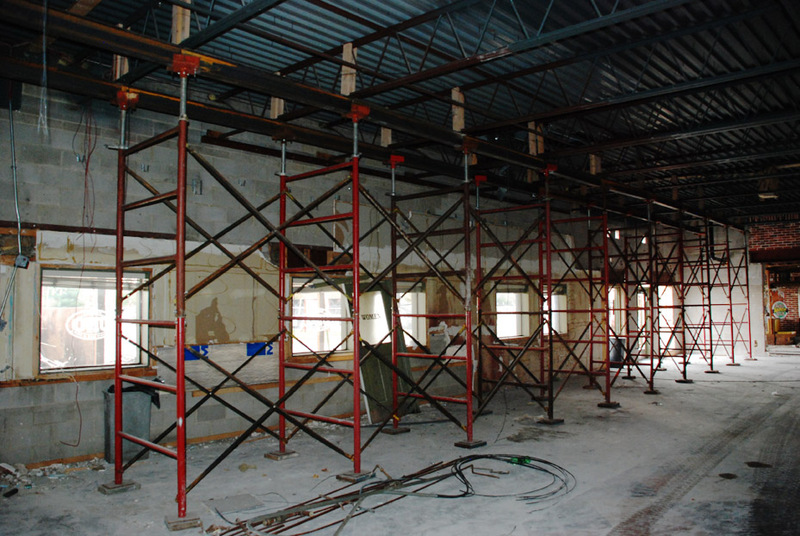 This is the side of the building where we staged our gear and the masonry crews accessed the job site. We wanted to limit the amount of wear on the landscaping and this access driveway was the perfect solution. 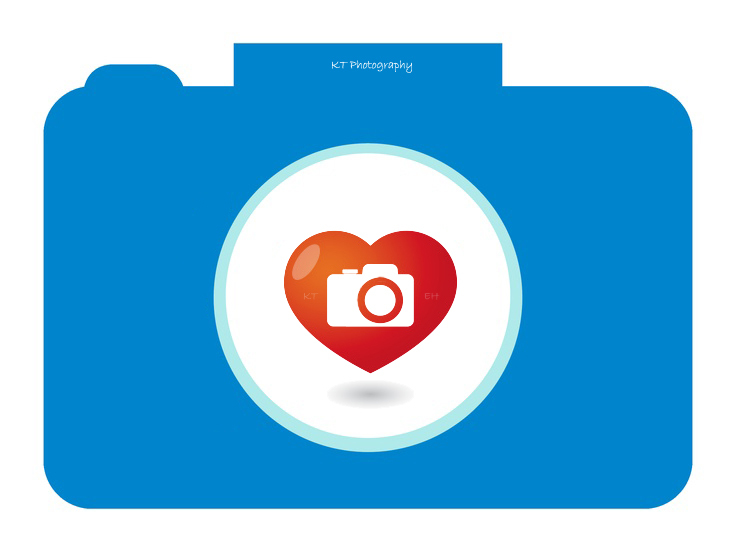 Our goal is to leave every job just as we found it. 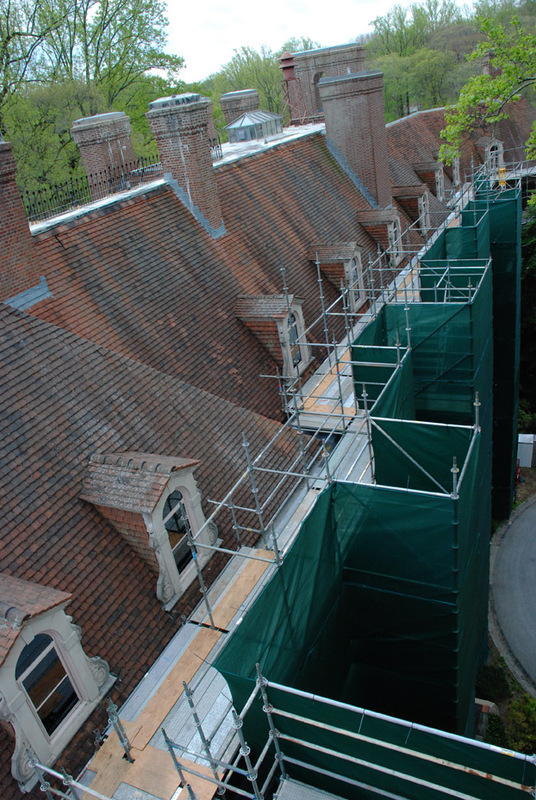 We were honored to have helped the Holy Ghost Prep School repair their parapet. 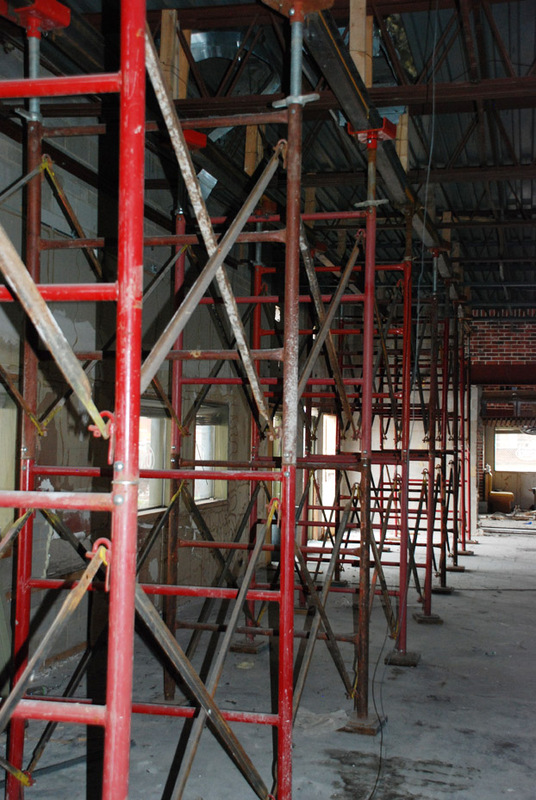 If you need access to hard to reach places or need scaffolding call (302) 766-5322 and ask for Tony P. Or you can log on to www.pinnaclescaffold.com to see more of our work. 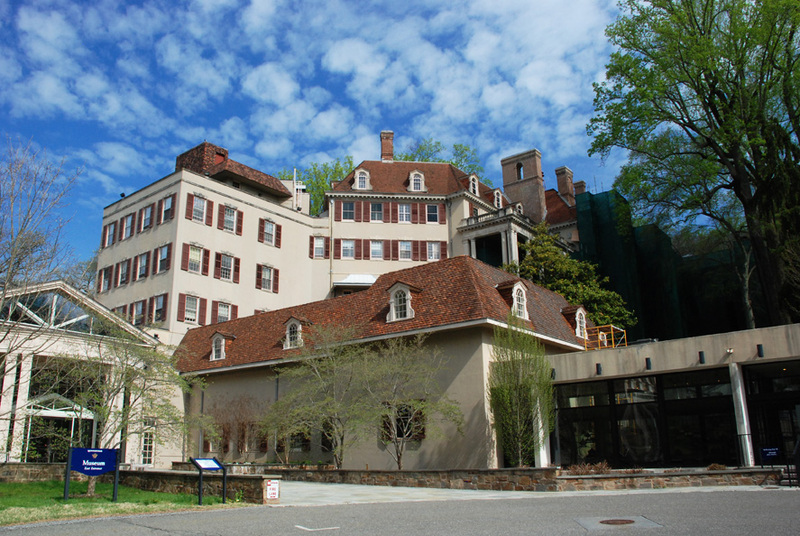 Winterthur Museum, garden & library is set amidst a 1,000-acre preserve of rolling meadows and woodlands. Designed by Henry Francis Du Pont, its 60-acre naturalistic garden is among America’s best, with magnificent specimen plantings and massed displays of color. 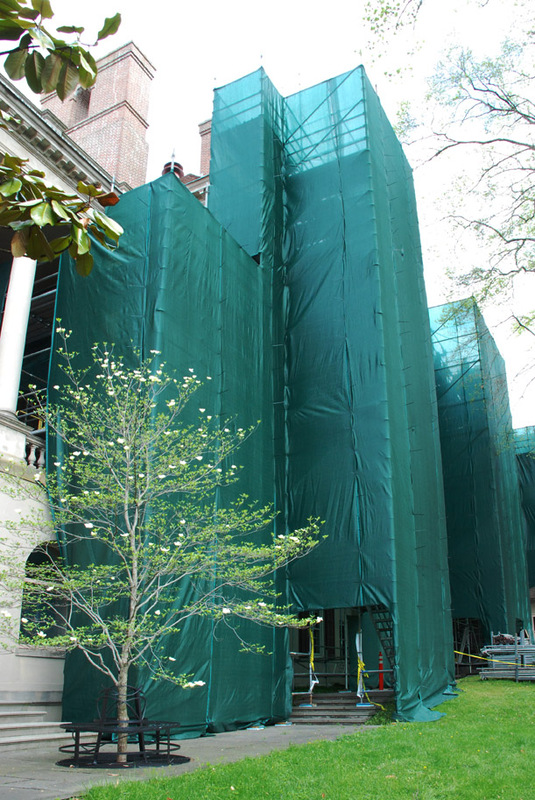 The exterior of the museum is undergoing a massive renovation. 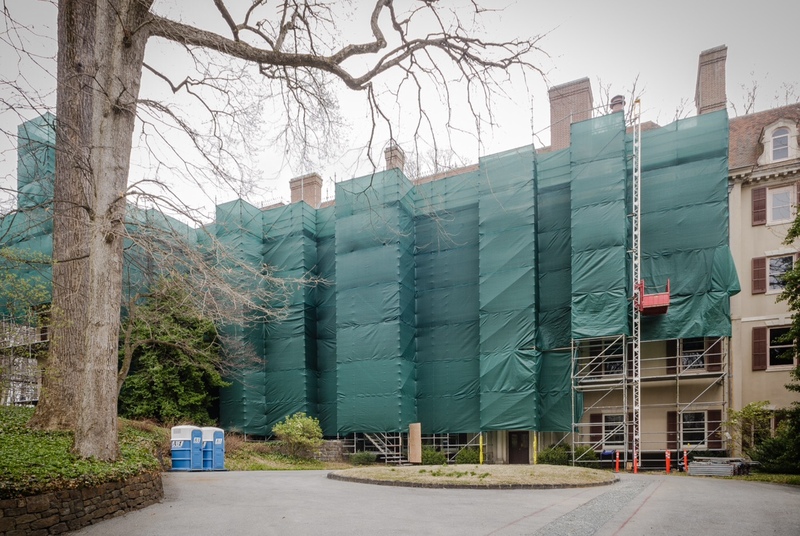 Crews needed to get to windows, siding, gutters, chimneys and more without disturbing a single part of it – and Pinnacle Scaffold was called in to provide access all the way up. See the video for the real perspective on the size and scope of this job. 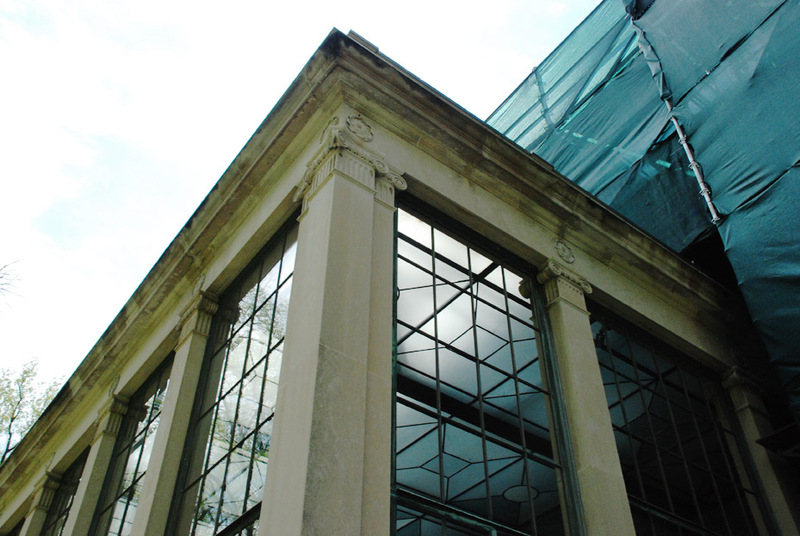 Pinnacle was hired because of our experience working with historic structures. 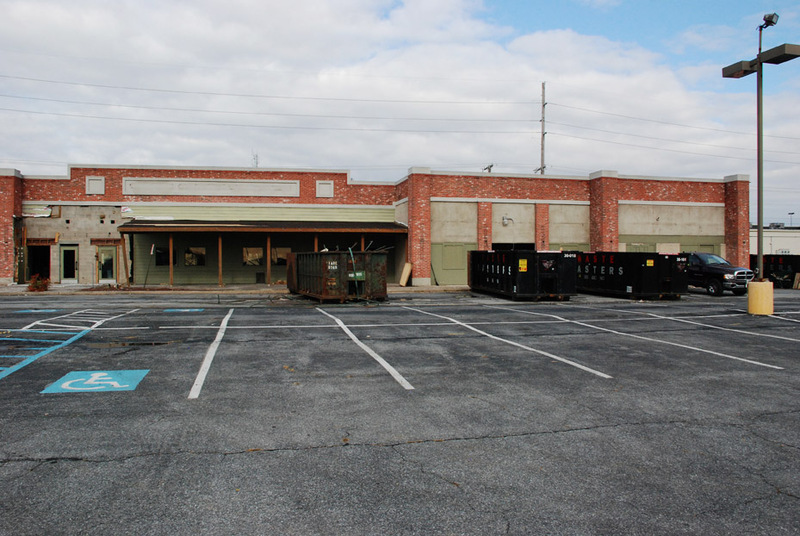 This project had several major challenges to overcome. 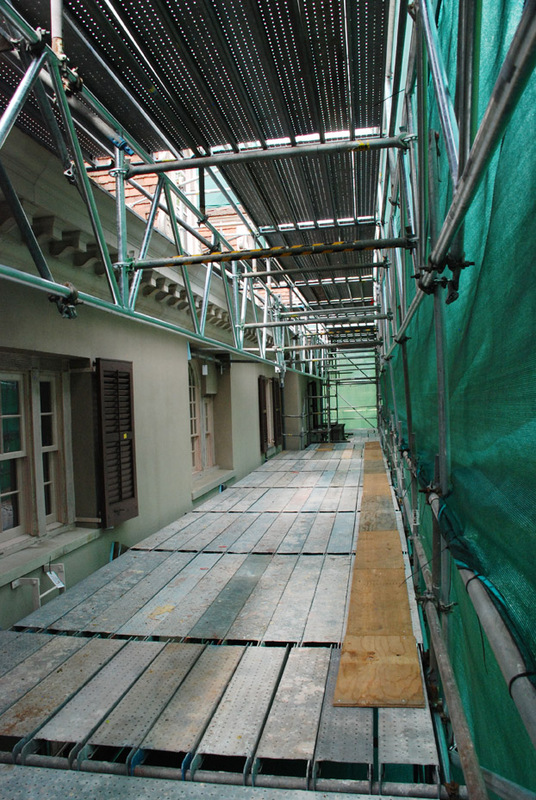 The first was that this enormous job (Approximately 1300 lineal feet of scaffolding) had to be completely self-supported and not tied into the building at all. That’s why you see so many support towers all the way around. Look closely at the photos and you will see the feet resting on top of wood then plastic leaning into the building. 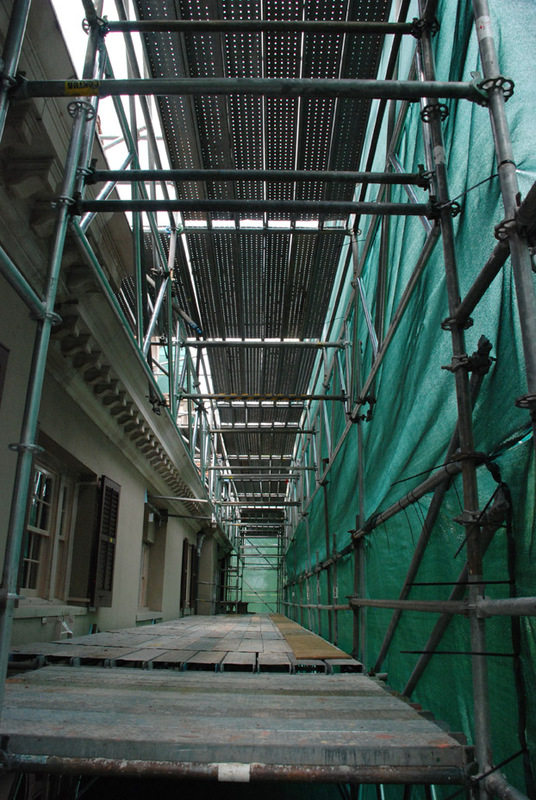 This design had to be completely engineered to support not only the weight of the scaffold but of the wind pressure added by the debris netting. 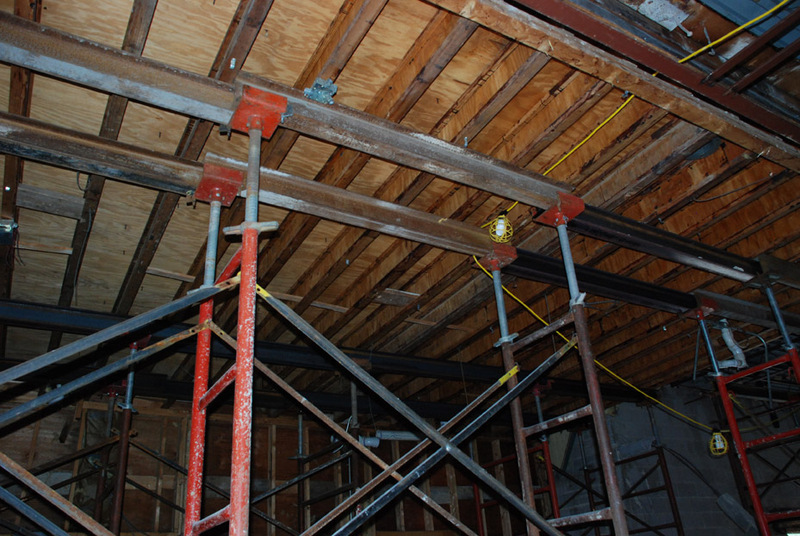 We used compression ties where appropriate and push ties where needed, all to protect the integrity of this historic building. The next challenge was how to span the 60’ gap over the top of the glass atrium. 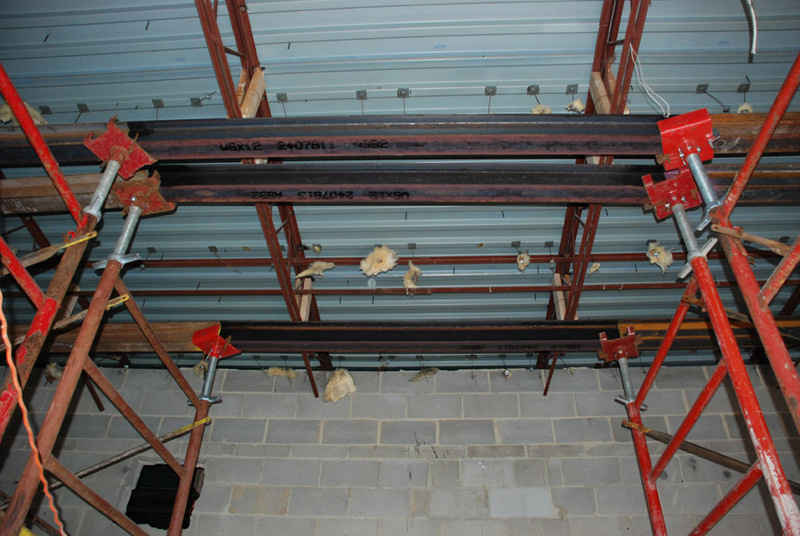 The next challenge was how to span the 60’ gap over the top of the glass atrium. That was done by having two of the largest trusses ever built (by Etobicoke) locked together to create one giant 60’ span able to handle the weight load. 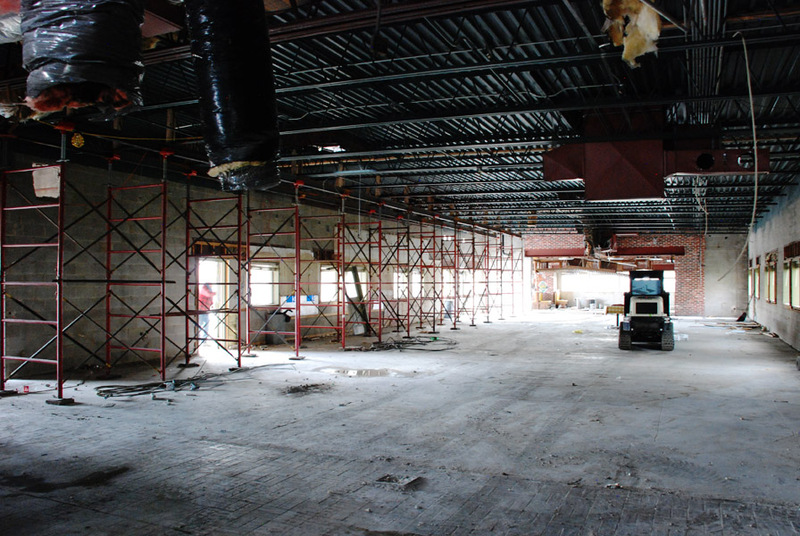 There are two levels of 2 X 60’ trusses over the atrium (again, see the photos). And Pinnacle smartly put debris netting beneath each level over the atrium just in case something were to slip off it would be stopped by the netting. 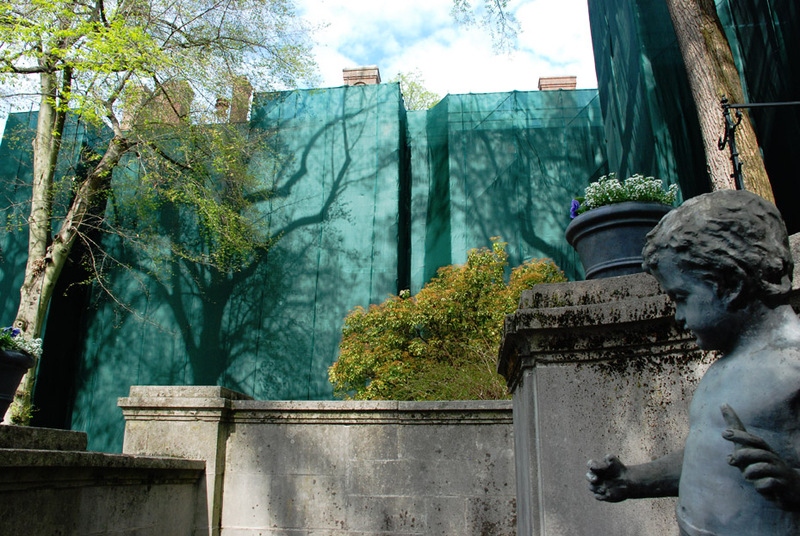 The next challenge was erecting the scaffold so not to disrupt the landscaping, gardens, or flowers. (See the photos of the base and of where the feet were placed.) That factor alone was an enormous challenge but put them all together and you get one tough scaffold job that Pinnacle was more than ready to take on. 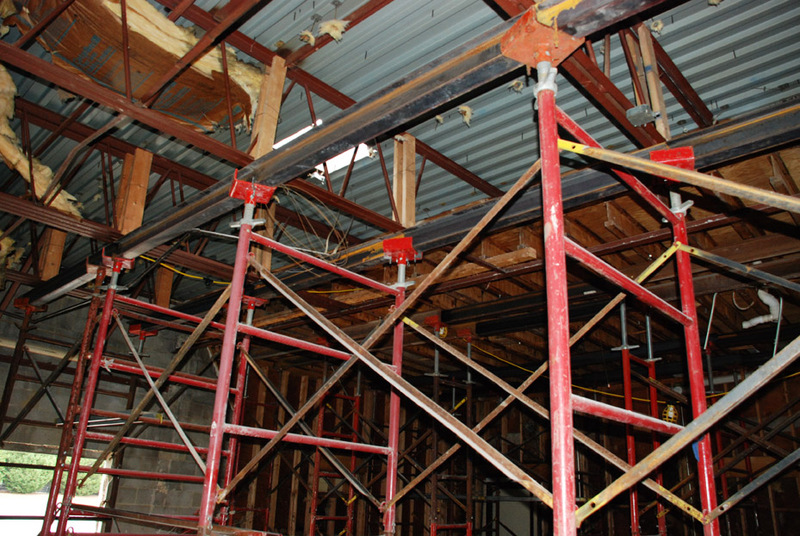 This job will encase the entire building in scaffolding and debris netting and then jump to another adjoining building. 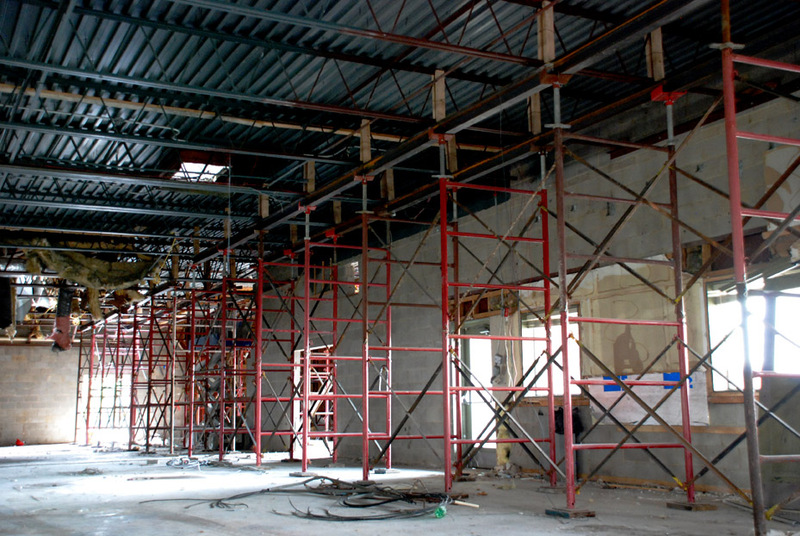 Scaffolding was chosen over aerial work platforms because of the sheer amount of work needed to be done on the entire outside of the building. 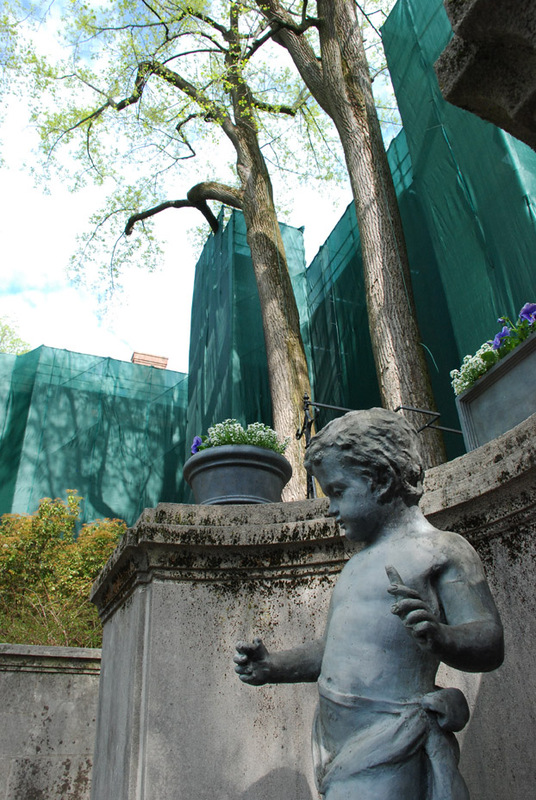 It was also the least invasive method to the grounds and the structure itself. The length of time was another factor. 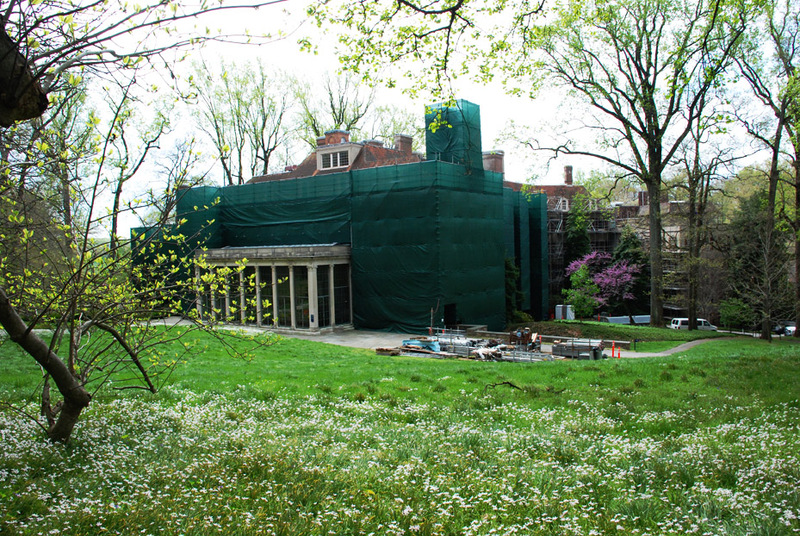 The first phase of the renovation will take at least 9 months to complete. 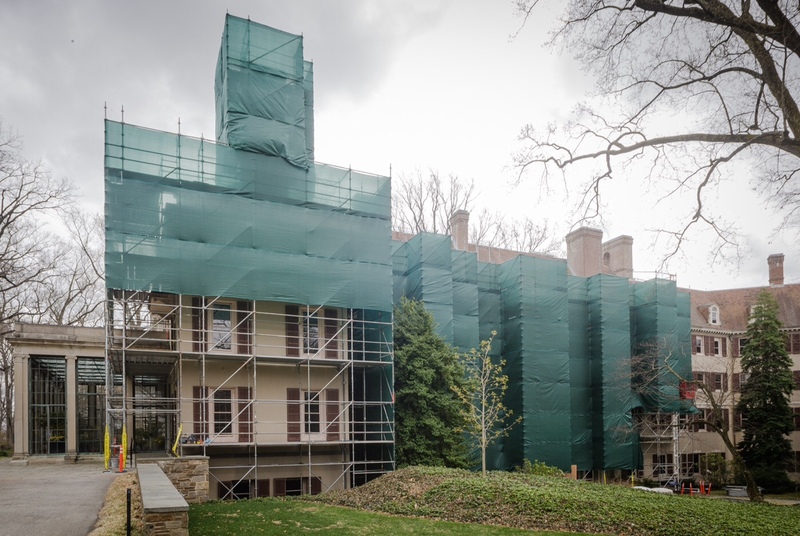 When you have an historic building or a delicate situation – call Pinnacle Scaffold today (302) 766-5322 or visit http://www.pinnaclescaffold.com.